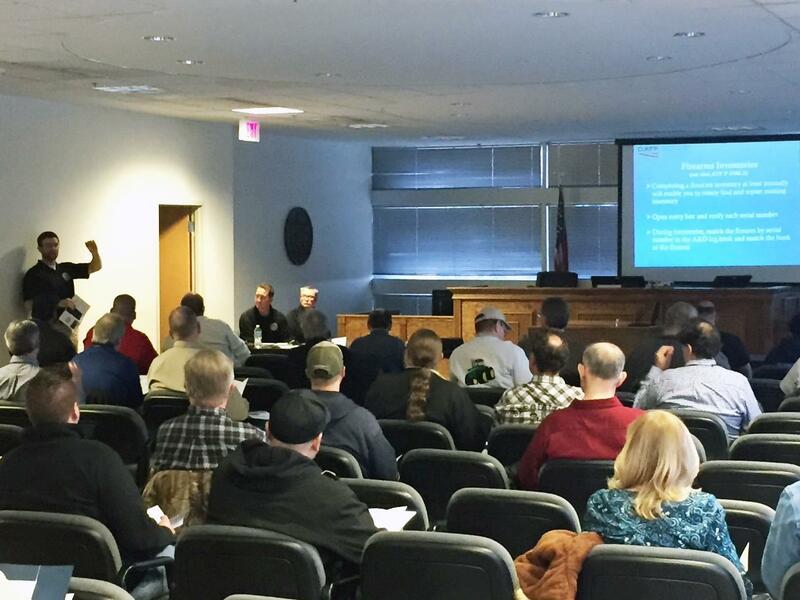 JANESVILLE, Wis. — The Bureau of Alcohol, Tobacco, Firearms and Explosives, along with the Rock County Sheriff’s Office, hosted an educational seminar for federal firearms licensees yesterday, Feb. 15, at the Rock County Courthouse in Janesville. The seminar was set up in response to the rash of gun store burglaries that recently occurred in southwest Wisconsin. Although there are no federal laws requiring FFLs to secure their firearms, ATF’s industry operations investigators recommend a variety of measures to reduce the number of gun store burglaries. Licensees received information on ideal methods for securing their inventories including installation of alarm systems and other physical security measures, as well as best practices in record keeping to ensure a good record of inventory is in place. "Partnering with firearms dealers is critical in order to prevent thefts and keep our communities safe," said Director of Industry Operations Hans Hummel, who is responsible for regulatory operations of ATF’s Saint Paul Field Division. "We want licensees to be aware that there are low-cost solutions that can be implemented. Many burglaries can be prevented with just a few safeguards in place." "This area of Wisconsin doesn’t typically see frequent gun store burglaries," said Assistant Special Agent in Charge Joel Lee, ATF, Saint Paul Field Division. "However, with the recent uptick, we felt it necessary to hold this seminar. When firearms are stolen, they often turn up at crimes scenes. FFLs are the first-line defense against criminals having access to firearms. We want licensees to be equipped with the best knowledge on how to prevent becoming a victim of any future burglary attempts. "The recent spike in firearm thefts are serious and continue to dominate the headlines," said Rock County Sheriff Robert D. Spoden. "These crimes affect the lives of our community members. This educational seminar will help educate our firearm dealers on methods to help safeguard their property and help keep the community safe. We were grateful for the opportunity to partner with the ATF on this important issue." More than 40 federal firearms licensees and their staff members attended the free event. Janesville and Beloit Police Departments also were in attendance to answer any questions. 20180215 – JANESVILLE, Wis. – An ATF Industry Operations Investigator presents to area federal firearms licensees on methods of securing firearm inventories including installation of alarm systems and other physical security measures, as well as best practices in record keeping to ensure a good record of inventory is in place.